This post has been in the back of my mind for some time now. 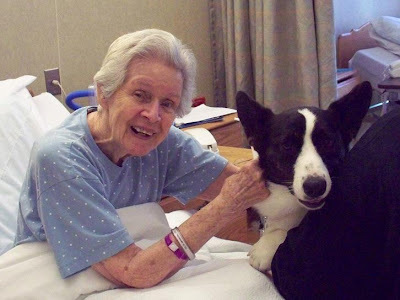 In the not too distant past my passion for dogs was questioned as having been lost. It really made me question 1. What did that person see that made them say it? (If it was true) 2. Was/Is it true?. First I don't believe its true! My life has always been surrounded by dogs and the life that I now lead is one I have wanted for many years. I love training dogs and maintaining a balanced pack BUT I love helping people that want to improve their dog and their own lives. I love seeing the change in "problem dogs" and the light in the owners eyes when they realize how simple the change is. So my passion is dogs but more specifically training herding dogs, what is your passion? There are so many facets to dogs and the life that we lead with them. I think there is room for everyone and their doggie passion. I have been involved with purebred dogs since I was 14yr old, I started with a Golden in 4-H, then my Schutzhund GSD and finally Beli:-)) I loved each of those opportunities but herding is my passion now. It is such a wonderful thing to see a dog know what to do on stock when they have never done it. It is still the most challenging thing I've ever done! I guess it is a good thing its my passion! While its hot here, and everywhere for that matter, the dogs always enjoy their late afternoon walk. We go up to the top pasture and they run, play and dive in the water to their hearts content. Life is good! Abby, Oli, and Rudy all think that the Aussie addition is for their pleasure only:-)) Patsy loves out running all the Cardis too. I know this is a blur... if I want to know where Abby and Oli are all I have to do is find Patsy. It is a constant play time when they are out together. Patsy favorite spot is the roundpen, she races around the edge with all the others in hot pursuit. I know I'm ready for summer to end but the dogs enjoy life regardless of the weather. Happy Birthday to the BeliXPeekers litter, they turn 3yrs today. Boy time flies! Pixel, Fern, Smarty and Bren hope everyone is doing well and having fun:-)) Pixel seems to be having a great time, I hope the others are just as well! Not much other news, just hot as HELL here! Yuck drenched in sweat everytime you go outside, we are certainly in the dog days of Summer now. The dogs can't do much on our walks now, just play musical water tub:-)) Dory is really enjoying her northern vacation now! We may have a new temporary member of the pack soon, more later. More updates!! First is Bolt was BOW/BOS over two specials, in MI today for his first major and and he is now sitting at 10pts/1 major. Yeah Bolt, unfortunatly Dory didn't fair as well but I know that she will hit full stride soon. Jill is doing a great job guiding her along! Second is pics of Remy in his new job! THERAPY!! 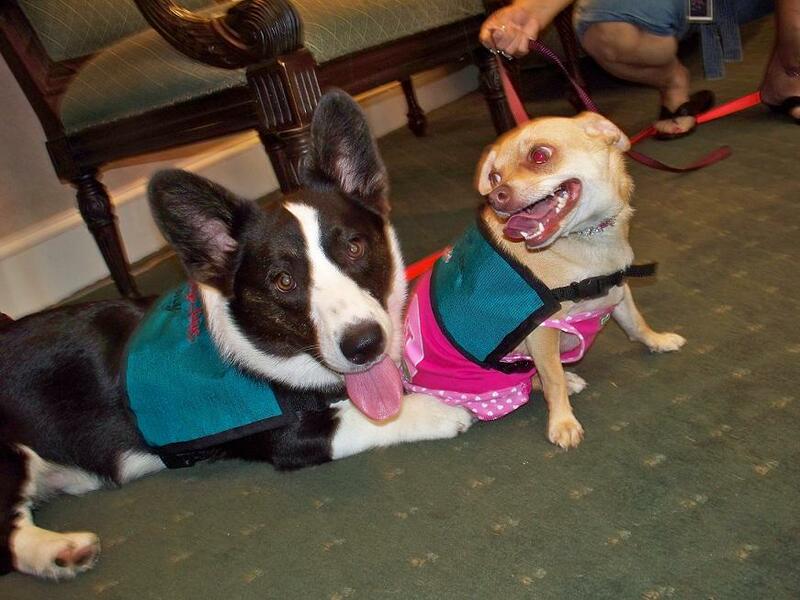 Remy and his buddy Diva at the nursing home. Well I have updates! 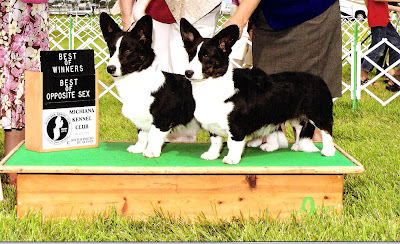 Dory's first point pic, we got it with her bro, since we hope to have more pics. Love this pic, its one I will cherish; you can really see the family resemblance! and Alice, pretty blue girl. She is enjoying the beach in RI/MA. Patsy on sheep, she is growing up so fast. Pretty girl still, no puppy uglies for her! The three FL Aussie siblings, left to right, Wick (w/Marti), Rize (Debby R) and Patsy. They were'nt overly cooperative but its a cute pic anyway! I had planned to post this yesterday but never quite got to it. We had a nice relaxing day other than chores around the farm. We watched fireworks on the hill and curled up to a late movie. I had plans to work dogs but never got to that either. This was exactly the weekend I needed! Patsy and Rudy, how they love to play but everyone needs a breather once in a while! Finally our current positions for today. The couches are really comfy but Beli would prefer the window seat!